In this post we are going to discuss about CSS Generators. There are number of Online tool to generate CSS and save time. In this post we are going to discuss about few of them. CSS (a.k.a. Cascading Style Sheets) is a style sheet language used for describing the look and formatting of a document. I must say this language have the power to change the look of a webpage. Now its always handy when you want to automate some thing, this is were CSS Generators will come in action as it will save your time by automatically generating CSS for you. Isn't is Cool. Yes It Is !!!. According to CSSAnimate, it is a tool for easy and fast creating CSS3 keyframes animation, right in your browser without using any desktop software. If you want to render complex and consistent CSS3 animation on your site this tool is made for you. You can create complex CSS3 keyframe animation without any coding and to get ready made css styles for using on your site. 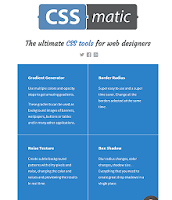 According to CSS Matic, it is the ultimate CSS tools for web designers. They have four options to choose from Gradient Generator ( Use multiple colors and opacity stops to get amazing gradients ), Border Radius ( Change all the borders selected at the same time ), Noise Texture ( Create subtle background patterns with dirty pixels and noise, changing the color and values and previewing the results in real time ), Box Shadow ( Everything you need to create great drop shadows in a single place ). According to Enjoy CSS, it is an advanced CSS3 generator that allows you to get rid of routine coding. Its handy and easy-to use UI allows you to adjust rich graphical styles quickly and without coding. The main features are 2D and 3D transforms, multiple complex transition, multiple linear and radial gradients, multiple box and text shadows and custom fonts etc. EnjoyCSS has its own gallery of ready CSS solutions that can be used for experimenting with styles. 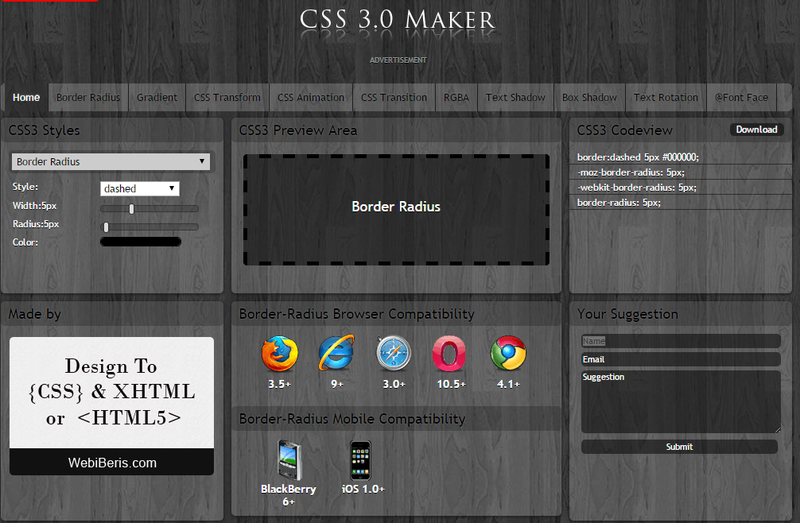 CSS 3.0 Maker is again a CSS generator site, where you can select the CSS3 style and get the preview side by side. You can even get the code preview. They have a number of options to choose from like Border Radius, Gradient, CSS Transform, CSS Animation, CSS Transition, RGBA, Text Shadow, Box Shadow, Text Rotation etc. Along with that they tell the user the browser compatibility of a certain CSS3 style which is a cool feature to have. 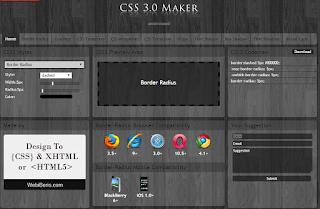 The above are the few CSS Online Generators, you can compress or beautify your CSS using the below sites. 1. CSS Compressor - Use CSS Compressor to compress CSS and o reduce CSS code size. 2. Code Beautifier - CSS for-matter and optimizer. 3. CSS Lint - Lint tool performs static analysis of source code and flag patterns that might be errors. These are the list which we think are useful, if you know any other site which does the similar operations please let us know. Please Like and Share the Blog, if you find it interesting and helpful.